I built an RV pad on my property with 50amp, water and sewer hookups. I use a thermostatically controlled water hose to avoid that freezing. Trailer is always plugged in with full time heat and dehumidifier running. I do not disconnect the battery, and I use the trailer daily, like a full-timer. “I do not winterize, but I do not store water in the tanks with the exception of the black which includes a 12v heater i keep on sub freezing days. No worries, you’re doing everything right—and you’re lucky to be able to keep your Airstream stored at home with hookups! Since you live in a mild climate and keep the trailer warm, there’s really no risk of the plumbing freezing and there’s no need to winterize. 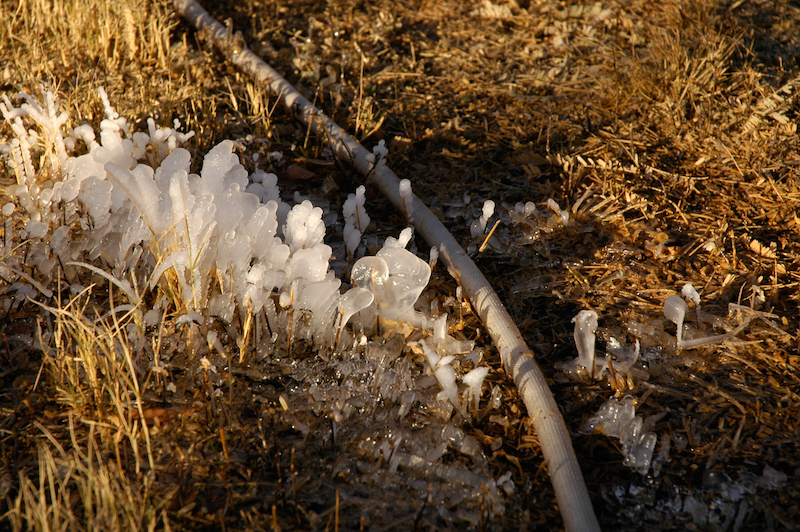 The heated water hose you are using will prevent that from freezing up, too. You definitely should not disconnect the battery if you are using the trailer. 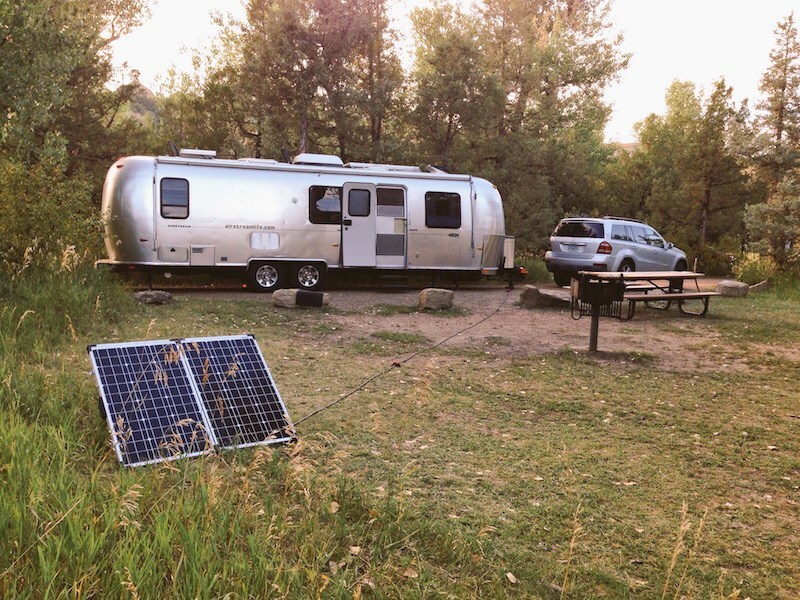 The battery provides a valuable function in the 12 volt system and the converter/charger is designed to be connected to a battery when the trailer is plugged in, even if you aren’t actually relying on the battery for power. Turning on the “kill switch” (battery disconnect) won’t help preserve the battery—quite the opposite, actually. Disconnecting the battery means it won’t get any power from the converter and will slowly self-discharge. The disconnect switch is intended for storage situations when shore power isn’t available to keep the battery charged. Sometimes people are concerned about the electrolyte (acid) in the battery “boiling off” as a result of a single-stage battery charger being plugged in constantly. The simple fix for this concern is to check the level of electrolyte in the battery every month or two and top it up with distilled water as needed. Take care when doing it, as you don’t want to splash acid on anything, including your skin, and always have some baking soda/water mixture on hand to neutralize a spill. One thing to be cautious about on a freezing day: don’t try to operate the dump valves if they might be frozen. You can tear the rubber seals, which will cause the valves to leak forever after. (In this case, you’d need to replace the valves—a slightly unpleasant task.) It’s best to just wait for warmer temperatures before operating the dump valves. In a pinch, you could use a hair dryer to warm them up. You’re smart to run a dehumidifier. In humid climates like the Pacific NW and the Gulf States it’s important to let the humidity out by opening the windows or running a dehumidifier. Long-term, excessive humidity will damage lots of things in the Airstream and leave unsightly stains on the curtains and walls. Even in the drier northern states humidity can be a problem in the winter because people tend to keep the windows tightly shut to retain the heat. Unfortunately humidity from people, animals, cooking, and washing builds up, so if you don’t have a dehumidifier it’s a good practice to keep a window and a roof vent cracked slightly. 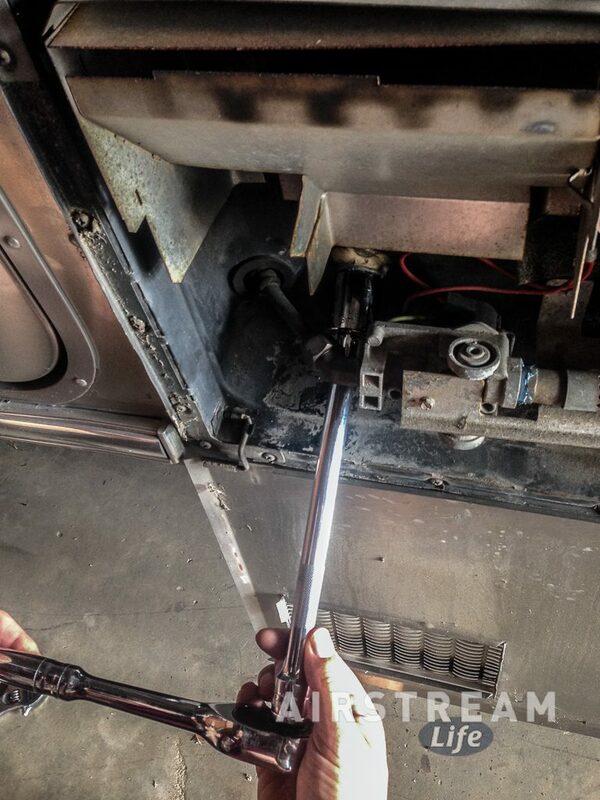 One of the most overlooked maintenance items on an RV is the drain plug on the water heater. They don’t last forever, and if you ignore it, the result can be super-annoying later. Typically the plug gets removed once a year, during winterizing, to drain the water heater. 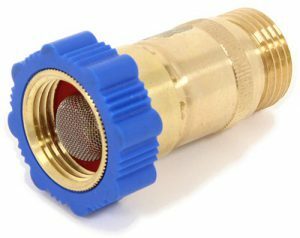 It’s made of nylon, because plastic won’t react with the metal in the tank (a metal plug, even a brass one, can result in corrosion). Because the nylon is soft and easily damaged, it should be replaced with a fresh one every time it is removed. But sometimes people (even technicians who should know better) will re-use the plug. This is a false economy. First of all, these plugs are cheap. They tend to be overly expensive when sold as “RV water heater plugs”. Try a local hardware store instead, and ask for a 1/2″ NPT plastic drain plug with 15/16″ head. You’ll probably find them at about a buck apiece, versus $3-4 each online or at RV shops. Get a few spares while you’re at it. I think people don’t like to deal with the drain plug because it seems hard to get to. Certainly it’s not conveniently located on RV water heaters, but it’s actually simple to remove and replace when you know how. So I’ll tell you. The main thing is not to try to get at the plug with an adjustable wrench. That’s what everyone tries to do because that’s the tool everyone owns. But an adjustable wrench won’t reach the plug very well, and you’ll probably end up scraping up your hands on the sharp edges of the vent above. 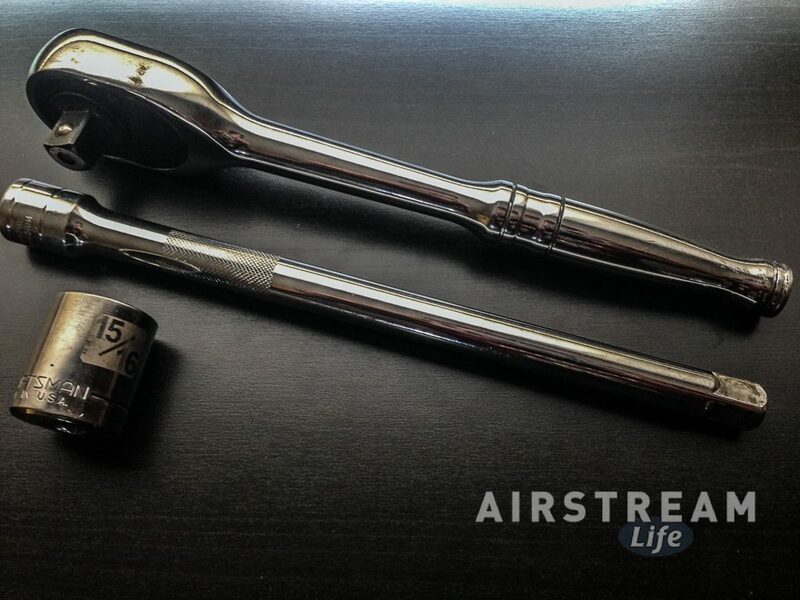 If you have the Airstream Life Tire Changing Kit, you already have the extension and a “breaker bar” that will substitute for the ratchet wrench in a pinch. All you need in that case is a 15/16″ socket (1/2″ drive), which you can get at a hardware store. Assemble the three tools and use those to easily remove a water heater drain plug in seconds. (Remember, righty-tighty, lefty-loosey.) Be ready for a gush of water as the plug comes out. A bucket on the ground below the water heater is helpful. Throw away the old plug so you’re not tempted to reuse it someday. Installing the new replacement plug is just as easy, with one extra step. Have some plumber’s tape (aka Teflon tape) on hand to wrap tightly around the threads of the new plug before you begin to thread it in. Put on three or four full turns of tape, and stretch it tight as you do. This will make your new plug leak-proof. You can skip this step but there’s a good chance the plug will ooze or drip water when the heater is on and the tank is pressurized, so I always use the tape. Start threading the plug by hand, to make sure it’s not cross-threaded. You should be able to give it a turn or two with your fingers. Once you’re sure it is going in straight you can switch to the tools to finish tightening it. Be sure to fill the water heater (run the water in the kitchen on full hot until no more air comes out) before lighting it. Check that the plug is not leaking before you light the heater. If all seems good, let the heater come to full temperature and double-check that the plug is not leaking. If it leaks, you may have to remove it entirely and use more plumber’s tape on the threads. 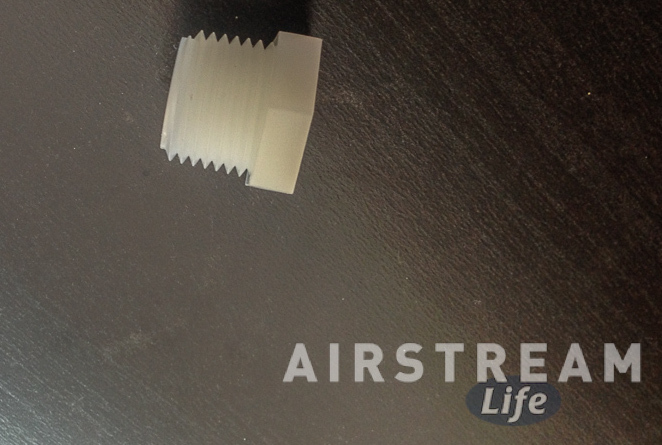 Don’t over-tighten the plug, because the plastic threads are soft and it could break. WARNING: Don’t tighten or remove the plug while the water is hot! There is a possibility you could over-tighten it and cause it to break, which would result in you getting scalded by hot water! Instead, let the water heater cool first. The fastest way to cool it is to turn off the heater and run the hot water inside until there’s no hot water left. If you read online RV forums about water heater problems or winterizing you’ll come across plenty of reports from people who struggle and skin their knuckles trying to replace this little plastic plug. Don’t be one of those people. With a very modest investment in tools and parts this plug can be removed in literally seconds, and replaced just as quickly. It should be done at least once a year, even if you don’t winterize, to ensure the plug doesn’t age out, and also to drain sediment that may have accumulated in the water tank. OK, let me expand on that. If you have an Airstream made in the past four decades, and nobody has removed the built-in water pressure regulator, you don’t need one to protect the plumbing. That protection is already built in. Honestly, I’m not sure why other manufacturers don’t build in pressure regulators. They’re not that expensive. I would never buy a new RV from a company that is too cheap to install a simple water pressure regulator. But apparently many do, because if you Google “RV water pressure regulator” you’ll find endless discussions about why you need one for Brand X, and all the awful things that could happen if you don’t get one. 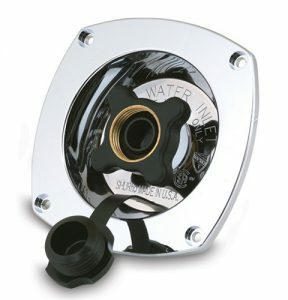 Sometimes people suggest using a water pressure regulator to protect the typical vinyl “white water” hose, because it’s still potentially exposed to high water pressure at a campground spigot. I don’t see the logic in spending anywhere from $9 to $30 to protect a $30 hose. Especially since that hose won’t last more than a couple of years in average use anyway! Instead, I bought a better hose that won’t ever be damaged by high pressure and will last for many years. In the long run it makes a lot more sense. 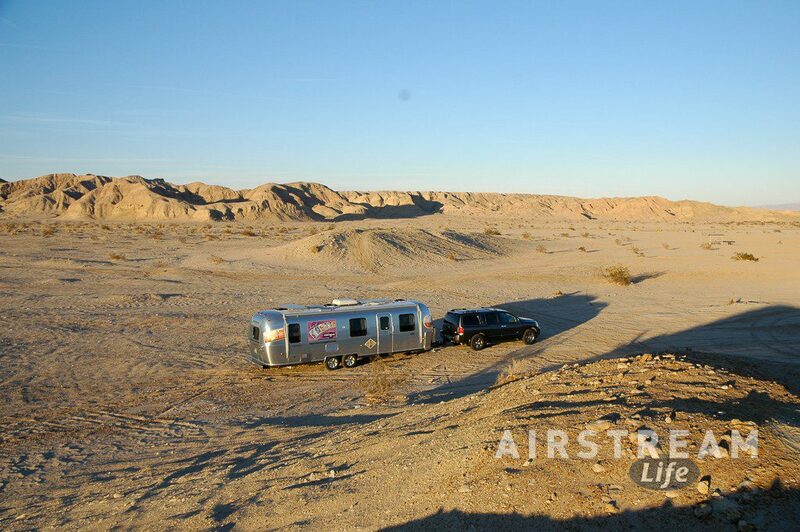 Things can be different for a vintage Airstream in which the plumbing has been replaced (as nearly all have). In this case it’s quite possible that the handyman who did the plumbing neglected to install a decent pressure regulator. Under really rare circumstances, you could have a plumbing problem as the result of excessively high water pressure. I say “rare” because the common problem in campgrounds is low water pressure. When we find a campground with high pressure I’m always kind of happy about it, because it means great showers. 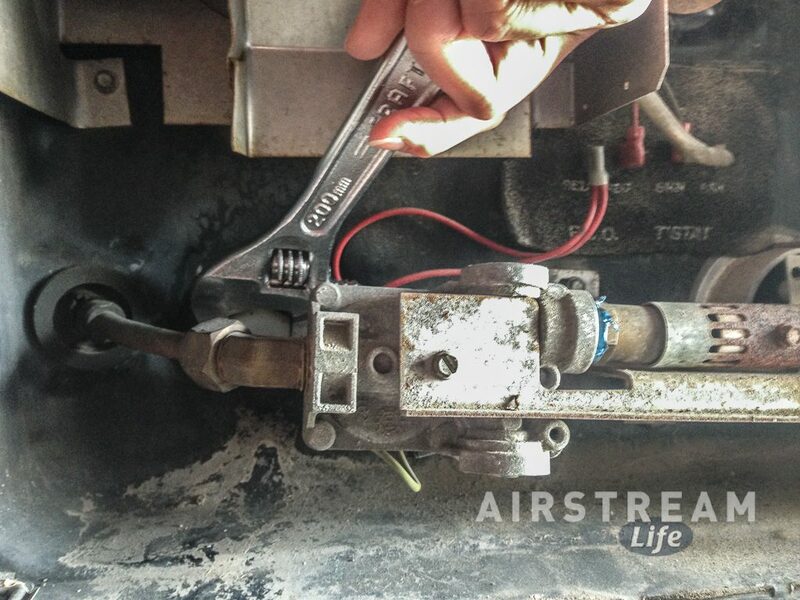 Still, if you find your Airstream has been “done over” by someone, check to see that a pressure regulator was installed. It should be very close to the city water fill (on the inside of the trailer), or more likely it’s integrated into the city water fill. If it looks like the one at left (a Shurflo) then it has pressure regulation built-in, and you’re all set. Bottom line: you probably don’t need another water pressure regulator. 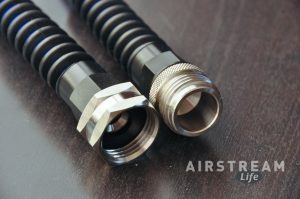 While there are a lot of “drinking water safe” hoses you can use with your Airstream, there are a lot of poor choices and only a few really good ones. 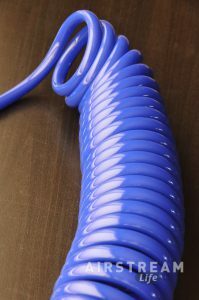 Commonly these are called “white hoses” but really the color doesn’t matter. What matters is that they don’t leach toxic chemicals into your water, they don’t leak, and they hold up under tough conditions. We have tested many types of RV drinking water hoses over the years, and sadly the bulk of them are terrible. While the initial purchase price is low, you end replacing them frequently because they just don’t hold up. The most common problem is pinhole leaks. For example, the typical RV hose is made of thin vinyl that can’t take being dragged across the ground, or isn’t UV stable. That means eventually the sun or the earth will cause cheap hoses to start leaking. Also, thin vinyl often kinks, or forms bulges (like an aneurysm) that eventually burst. Sometimes people try to avoid this problem by using a water pressure regulator on the end of the hose, but that’s just an extra expense to protect a disposable product. And if you drive over the hose while it has water in it, it will usually burst anyway. If you’ve ever tried those white fabric roll-up hoses (sold on a reel) you know they’re even worse: with just normal use and abrasion on the ground they’ll spring pinhole leaks like a sprinkler. See the ice in the photo above? It’s from pinhole leaks spraying all night long. So cheap hoses are really not cheap, because you’ll be replacing them every year or two. plastic — the worst choice. These tend to crack or leak quickly. aluminum. Because aluminum is soft, the fittings eventually bend out of shape from repeated screwing on and off the hose bib, which causes leaks you can’t stop. brass. Brass is traditional because it’s durable and non-corrosive, but brass also normally contains lead. This can leach into your water even when the hose is labeled “lead free”. To prevent this, some manufacturers cover the brass with nickel or chrome plating. This is an OK choice. stainless steel (pictured above). This is the best. Zero lead content, and food-grade connectors that will never corrode or bend in normal use. Very few hoses use stainless because it’s more expensive. Personally, I get frustrated with hoses that stiffen up in the cold. When it’s chilly outside I don’t want to be wrestling to coil up the water hose. That’s why I like hoses that stay flexible in all temperatures. I’ve also become a big fan of pre-coiled hoses like the one pictured below. These things are awesome because they never “forget” how to coil back up. I’ve stretched this one out until it was entirely straight, and it sprang right back to its original shape afterward. Plus they’re much lighter and pack smaller than traditional hoses, so I can carry a longer hose with less weight and bulk. Finally the biggest consideration is safe water for you to drink. All drinking water hoses are supposed to be free of lead, phthalates, and BPA. They should never be made from poly-vinyl chloride (PVC), and they should be completely light-blocking so algae can’t grow inside. They should also be rated as safe for hot water use, because that tells you the hose won’t deteriorate or leach chemicals when it is sitting in the direct sun all day. There are a few hoses that meet most of these requirements, but we’ve found only one that meets all of them. That’s the only drinking water hose we sell, and we back it up with a 5 Year “No Hassle” Replacement Warranty. Check it out here. By the way, you might be wondering why we sell a narrower hose than most others on the market. (Our Ultimate Drinking Water Hose is 3/8″ inside, versus 5/8″ in most hoses.) It’s because the 3/8″ size coils up better and is easier to handle. Sometimes people will think that the hose has to be big in order to get good water flow, but this isn’t true in this case. All of the plumbing in your Airstream is 1/2″ diameter and the fixtures are designed for a maximum flow of 2.5 gallons per minute. Our 3/8″ Ultimate Drinking Water Hose can deliver nearly 5 gallons per minute, so it’s still more than you need. Bottom line: there’s no need to wrestle with a traditional stiff and heavy hose that’s bigger than the Airstream’s plumbing can accommodate!